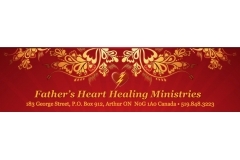 Father's Heart Healing Centre can be likened to a "spiritual hospital". It is set up like a physician's office/walk in clinic. Ministry teams are available during clinic hours to release the presence and power of God for healing of the body, soul and spirit. Our centre offers powerful healing ministries such as the Healing Rooms, Sozo, Mobile Ministry and Spiritual House Cleaning. Wed 10:30am-2pm and Fri 7:30pm-9:30pm.